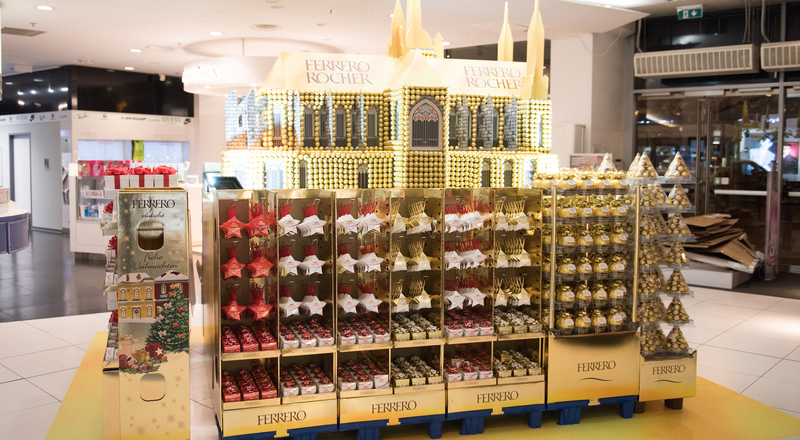 Ferrero approached us with extraordinary challenge – a premium Christmas solution of Ferrero Rocher in Tesco My in Prague’s prime location. 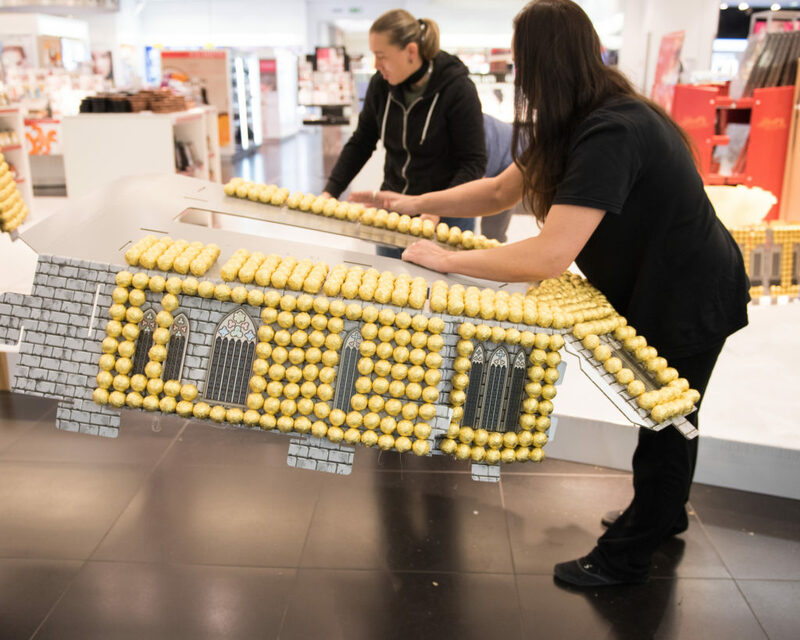 Centrepiece was to become a model of St. Vitus Cathedral covered with Ferrero Roche pralines. The St. Vitus monument is registered for the 2018 Popai award. After initial brainstorming we bought a small 3D puzzle and started throwing ideas around. 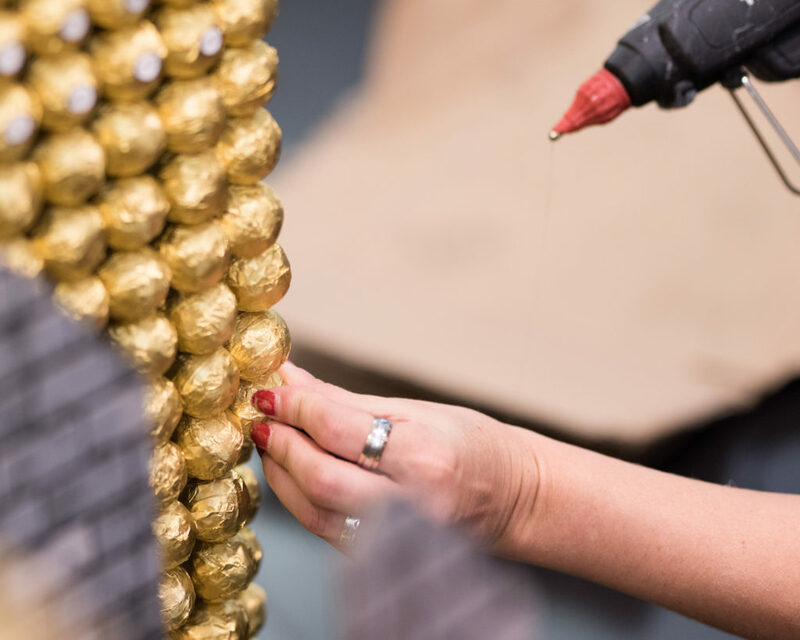 Upon consultation with print expert we decided to use the model templates and size them in-house via 3D modelling & design – the green light from Ferrero came shortly after first visualization! Along the way, we worked closely with the print house on the technical solution. Unprinted sample was prepared in 1:1 scale for testing and before the final print production and hand-made decoration. We installed the Cathedral POS overnight in Tesco together with Ferrero’s prime product holders, floor sticker and pallet covers, all supplemented with a custom-designed LED lighting solution. 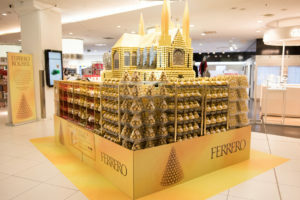 The dazzling result – a sparkling golden Christmas monument – made passing crowds to stop, admire the exposition, take pictures and purchase variety of displayed Ferrero products. GlaxoSmithKline (GSK) is one of the largest global pharmaceutical firms. Their goal was to launch a marketing campaign introducing latest innovation in the Czech and Slovak markets. Secondary goal of the campaign was to accentuate the brand and, specifically of the Sensodyne Rapid Extra Fresh products in a wide-ranging, effective manner. First came creation of the key visual, in which we combined introduction of the innovated product together with a gift to each purchasing customer. In this campaign we decided to interconnect GSK and Sensodyne Rapid Extra Fresh with Ferrero and one their leading brand – TicTac. The result was a modern, eye-catching and easily remembered visual. We designed and manufactured a combination of patented Maxi Lama display, accentuated by distinctive pantone colors and foldable promotable with product storage space. The promo sets were used in selected locations including supermarkets, hyperparkets and pharmacy stores. Procter and Gamble invited us for a briefing of a new, secret project – massive launch of Lenor Unstoppables Pearls in Globus chain of stores. Complemented with TV ad and consumer contest, we designed for P&G unparalleled POS campaign. We created 3D design for better visualization and determination of appropriate materials. We incorporated cardboard, plastic, paper and light to get maximum consumer attention with variety and visual effects. Since every single Globus store required individual approach, we coordinated with P&G shoppers and Globus store managers and, ultimately, designed and produced 15 distinct palette decorations. Lenor pallet decoration consisted of wide range of POS materials, including plastic shelf stoppers, 3D elements on sponge, floor sticker, wobblers, pallet wraps, toppers, Lama displays shaped as silhouette of Unstoppable Pearls package and LED shelf lighting. 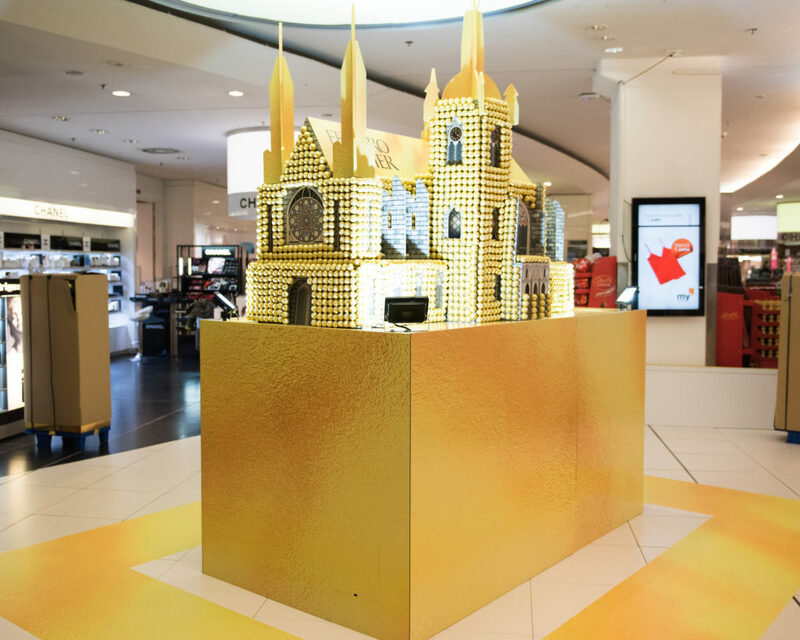 Final challenge we faced was decoration assembly & installation within 36 hours in 15 Globus stores across the country including product placement.